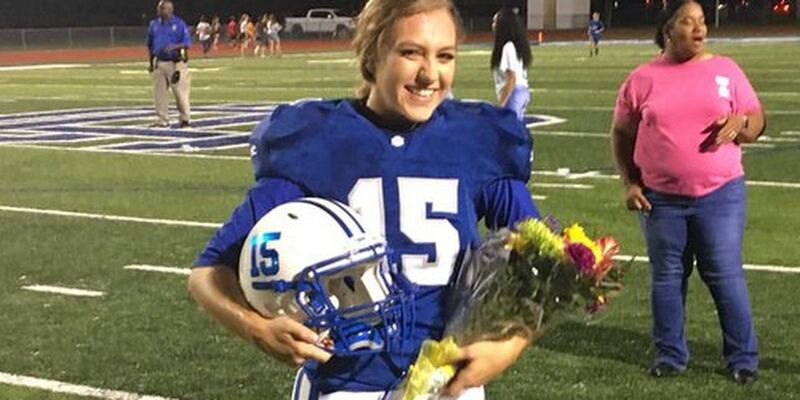 OCEAN SPRINGS, MS (WLOX) - Kaylee Foster has made quite the name for herself in Greyhound Nation and for good reason. The senior was crowned the 2018 Ocean Springs High School homecoming queen at halftime during Friday’s game. A short time later, she kicked the game-winning extra point to beat the George County Rebels. So how does the star of Ocean Spring’s homecoming game celebrate on the day after? She spent Saturday morning taking the ACT before preparing for Saturday night’s big homecoming dance. Thanks to Foster, the team beat the Rebels 13-12. Seven of the 13 points came from two Foster field goals and the game-winning extra point in overtime. The homecoming queen is getting a lot of attention and says she’s quite surprised by all of it. This is the sixth year the athlete has been shaking things up on the football field; but she also plays soccer and runs track. “They’ve always been very welcoming of me and what I’m trying to do. They don’t like treat me any differently other than I don’t go into the locker room,” she added with a laugh. She said she always has had support from her family to play football. “Always told the girls, you know, life’s an opportunity. Go see what you can do. And they’ve both taken the advice on that and both exceeded at everything they’ve done,” said dad Jerry Foster. Annie Johnson is a digital producer at WLOX. On a normal day, she's writing stories for the WLOX website, developing breaking news stories, and engaging viewers on WLOX’s social media platforms.